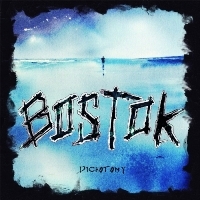 Spanish alternative metallers BOSTOK return to the metal scene with their second full-length release “Dichotomy”. The record truly lives up to its name as a juxtaposition of the gritty with the delicate, being calm yet downright intense at times. The band themselves consist of vocalist Sergio Jaén, keyboardist Senent Miró, guitarist Manel Espinosa, drummer Joan Bernabeu and bassist Moisés Vidal. This album’s sound generally consists of a combination of guttural and clean vocals, with the inclusion of synths and of course riffs and bass lines. The title track – which is also the first track – opens with a spoken passage set amidst an ominous backdrop filled with tinkling sound effects. Riffs and bass lines are soon introduced to this song along with the harsh vocals of Sergio. Personally, I find the addition of the chorus at the end of the song to be rather awkward. However, it is not until the second track that the album actually gets interesting (at least for me). The synth opening for “Feel The Abyss” sets the suspenseful tone of this track, transitioning into a full-on metal performance. The song slows down halfway to present a mysterious atmosphere filled with disembodied, whispered voices, only to resume its brutality near the end. I admit that I was rather weirded out by “The Feeling” at first. Contrary to the song’s vicious nature, the track is in fact about love. The intermittent clean passages combined with articulations of the word “love” and harsh singing makes this a rather bizarre composition in its own right. As much as it is strange, it does have the occasional charm. “Eternal Rain” begins with repeated enunciation of the phrase “eternal rain” set amidst a soft drum backdrop. Soon, the guttural vocals join in with the rest of the song. However, the clean vocals near the end of the track sound very dull and weak in contrast to the riffs and drumming. Next is “Pause”, a tune that begins with a mellow keyboard intro and soothing cleans. The track is concocted as a mixture of spoken passages presented in a sing-song format with clean singing. The second half of the track gets heavier with the introduction of bass hooks and drum beats, which soon segue into a final verse filled with guttural passages and sinister laughter that gradually fades into nothingness. In other words, it is a tune that seems to appear as a power ballad, only to turn around and surprise you with a multitude of riffs and suspenseful musical effects. “Under Chains” starts off fine, but the problem arises when the clean vocals enter the picture. The clean vocals here sound rather strained, as if the singer is pushing himself to his limits. Fortunately, the closing track “A Tale” makes up for the slight disappointment in the previous songs. The full-blown aggression coupled with the delicate cleans in the second half of this tune complement each other really well in this case. In conclusion, “Dichotomy” is a diverse production which walks the line between heavy and the tender. However, it is not an album for everyone due to its unconventional structures and usage of varying vocal styles. Do pick up this album if you are looking for something more atypical and would like to experience a change of musical taste.